Diarrhea refers to loose, watery stools that occur more frequently than usual. It can also involve other uncomfortable symptoms such as bloating or stomach pain. Canned pumpkin can be part of a diet to prevent or treat diarrhea, but the effects can vary among individuals. Consult your doctor if you have prolonged or recurring diarrhea because it can be an indication of a serious medical condition. There are two types of fiber: soluble and insoluble. 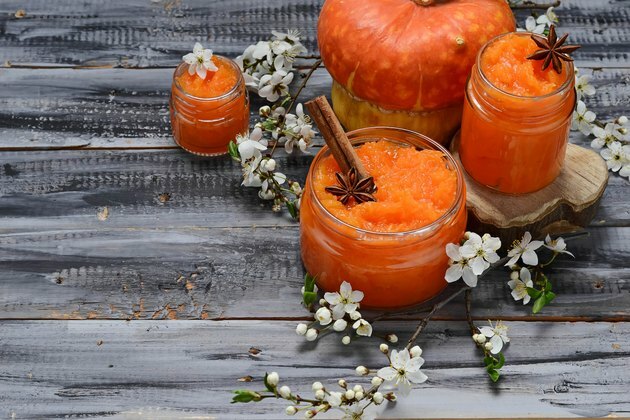 Soluble fiber, which is found in pumpkin, absorbs water from the digestive tract, forming a gel-like substance that slows down the digestive process. Each cup of canned pumpkin provides 7 grams of dietary fiber and only 83 calories. Fiber in your diet can relieve diarrhea because it makes your stools harder and less loose. Diarrhea can cause excessive losses of potassium from your body, resulting in a condition called hypokalemia, or dangerously low levels of potassium in your blood. Hypokalemia can lead to fatigue, cramping, weakness and even death. Consuming canned pumpkin can help replenish the potassium you lose when you have diarrhea. One cup of canned pumpkin provides 505 milligrams of potassium. Other high-potassium foods include fruits, nuts, acorn squash and beans. While canned pumpkin is a good source of potassium, each cup only provides 12 milligrams of sodium, or less than 1 percent of the daily value based on a 2,000-calorie diet. Potassium and sodium are electrolytes, or minerals that help maintain the water balance in your body. When you have a bout of diarrhea, you may also need to replace lost sodium. You can get sodium by adding salt to your canned pumpkin, or making a pumpkin soup using a broth that contains salt. However, keep in mind that in some people, sodium increases blood pressure because it holds excess fluid in the body, creating an added burden on the heart, according to the American Heart Association. As such, you only want to replenish the sodium you lost and not consume it in excess. When you have diarrhea, you need to increase your fluid intake to prevent dehydration or to become rehydrated. Another benefit of canned pumpkin soup is that it can help you increase your fluid intake if you get tired of just drinking water. Avoid eating canned pumpkin if you have fructose intolerance, a condition in which your body has trouble digesting fructose. Fructose is a natural sugar in fruit, and it can lead to diarrhea, gas and bloating when you eat fruit. In many cases, your diarrhea will not lead to damaging consequences, but you should consult a doctor if symptoms last longer than three days or if you suspect a more serious condition.